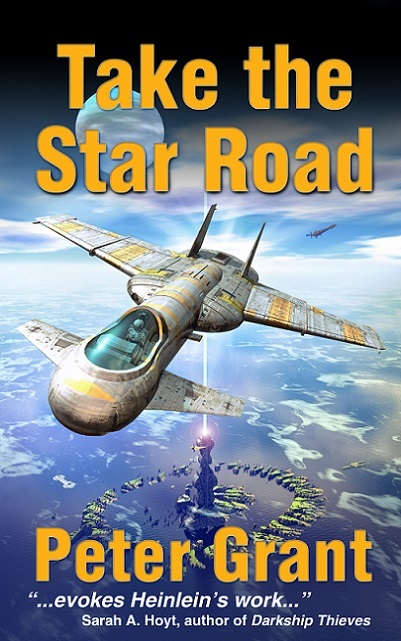 Peter Grant’s new book Take the Star Road is now available at Amazon. I read it when it was being edited and re-read it again when making the cover design. I recommend it, especially if you like the style of early Heinlein. The book is far more about people and culture than it is about future technologies, which is how it should be. 1984 would have been less interesting if Orwell described the specification and maintenance details of the telly screen in greater detail. Much of the plot came from the author’s extensive adventures in rough and scary parts of the world. This entry was posted in book, interesting people and tagged adventure, Navy, space. Bookmark the permalink. Someone really did a number on the cover illustration. When it is so doable to contact awesome illustrators over deviantart.com. So how much does decent cover art cost? I’ve been writing a space-western (posting sort-of-daily episodes to get feedback), and it’s getting almost to the point of being finished enough to think about publishing, and so I’m starting to think about these sorts of details. Any and all info on the subject welcome, here or as a comment to a post on the story. No idea, but there is a lot of good illustrators on deviant-art. You could probably get someone cheaper by looking for artists not residing in places with high incomes.. like Singapore. Very reminiscent of a Battletech Aerospace fighter.